Artecy Cross Stitch. Little Celtic Designs 2 Cross Stitch Pattern to print online. 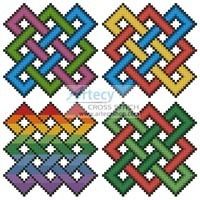 This counted cross stitch pattern of cute, little, easy to stitch, Celtic Designs was created from the Celtic Knot Font from www.Clanbadge.com.